Go back in time as you walk the historical streets of Krk town! 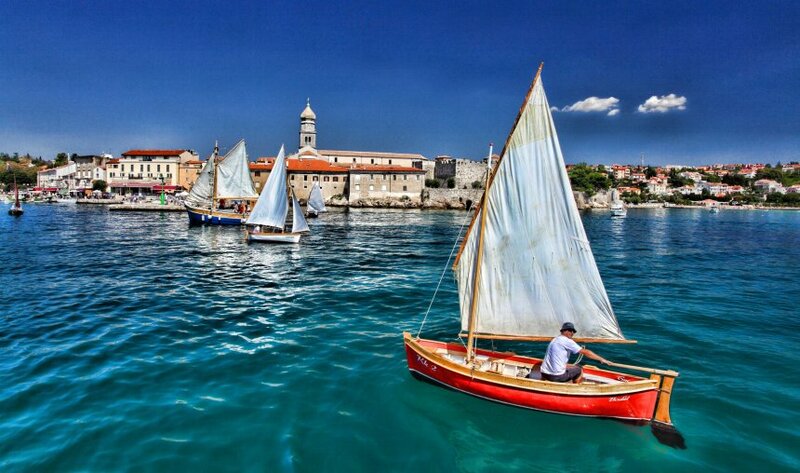 One of the oldest settlements in Croatia, Krk was founded by the Illyrian tribes more than two millennia ago, when the town walls, the third largest in Croatia, were built. From the 12th to the 15th century Krk was ruled by one of the most renowned Croatian noble family, the Frankopans, who constructed the Frankopan castle at Kamplin square. Apart from being Krk’s landmark, it is the part of the town where various events and performances are often held. Vela placa square with the 16th century well and the former town hall has been Krk’s central point for centuries. It is one of the most popular places to meet and have a great time. To complete the picture of Krk’s historical core an absolute must is the Cathedral which dominates its skyline. Built on the location of ancient Roman thermae, the basilica from the 5th century experienced a number of style changes to what is now a Romanesque cathedral. It was first mentioned in the 12th century and it is dedicated to the Assumption of Mary. For a quick excursion, go to Košljun, an island in the bay between Krk town and Punat. Take a walk through refreshing woods and visit the Franciscan monastery from the 15th century and see the diverse museum collection (ticket €3), which includes documents written in Glagolitic script, used by the Croatian people almost a millennium ago. Swim in the crystal clear sea, then sunbathe on a lounger with a good book or your favourite music. Play on the shore with your children or simply relax in the shade. The island of Krk is famous for having excellent beaches with Blue Flag status, one third of which are situated in Krk town. One of the most popular choices is Dražica beach. A particular favourite for families with children, this partly rocky and pebbly beach is surrounded by Mediterranean greenery with plenty of shade. For a beach closer to the town centre, go to Portapisana near the eastern town gate. This concrete and partly sandy beach offers you a place to swim with a great view of the historical core. Just five minutes away from the old town entrance, Porporela beach is another excellent choice for families with children and people with disabilities. Apart from Porporela and Dražica, other beaches that have been awarded Blue Flag are Ježevac, Dunat and Jert. Up & go! Use the moment of your holiday to completely relax and then recharge your batteries with happiness hormones by being active. Krk offers you plenty of exciting activities to choose from. Wander the maze of historical streets, along the shore, through olive groves and villages nearby. Cycle along numerous trails, on and off road, to get to know the island. Play (table) tennis, beach volleyball and other sports. Make use of Krk Street Workout Park and practice yoga, pilates or aerobic by the sea near Dražica beach, only to treat yourself to a fish pedicure afterwards. For an extra adrenaline, do water sports and try out a zip line across Dražica cove, learn how to wakeboard at the Ski Lift Krk or dive in many exciting spots near the island. Join in the fun and festivities of Krk town! While various events and festivals, particularly those that are dedicated to traditional island delicacies, take place throughout the year, the events calendar is the busiest in the summer. Krk summer festival, which is held in July and August, includes concerts, plays and dance performances and creates exciting ambiance in the town centre. The town is also famous for its centuries-old fair Lovrečeva in August, which gives the visitors a taste of what life was like from Middle Ages onwards. Krk for kids! Apart from typical summer fun such as swimming and water sports, Krk town is an exciting place for children of all ages. They can pretend to be knights for a day as they explore the Frankopan castle (ticket €2-3). They can also step into the exciting animal world by visiting Aquarium/Terrarium (ticket €3-5) in the town. For an extra adrenaline, tweens and teens have the chance to try out go-kart at the Karting Klub Krk. Be in the right place at the right time! The pleasant climate in the town of Krk allows visitors to enjoy their time there most of the year and not only during peak season in the summer. With the average sea temperature of over 21° from May to September and rare winds, the agreeable weather is the perfect excuse to visit the town also in spring and autumn, particularly for holidaymakers who wish to avoid the summer crowds. People travelling by car can reach Krk island easily from all directions on the mainland due to the extensive network of Croatian motorway. Furthermore, the island is connected to the land by Krk bridge (€5-6 toll), so there is not need to queue for a ferry. Krk town is situated on the southwestern part of the island and it is a half an hour drive away from the bridge. Visitors from more distant countries can also fly to Rijeka Airport near Omišalj on the island and then take a taxi to reach the town of Krk (€35) or catch a bus via Omišalj (altogether €8). All it takes for a fulfilling holiday! Lovely beaches to relax. Rich culture and history for you to discover. Fun activities to keep you active. Exciting events for your entertainment. Pleasant weather for you to spend your holidays outdoors. Krk town is simply a great place for an amazing holiday and an absolute must-see on the Adriatic coast!